One of the Elements of Art is Texture. When one thinks of texture in art, it usually conjures up images of sculpture, ceramics, textiles, and, sometimes, painting. I dare say last on the list of art forms would be architecture. However, texture has been a significant aspect of architectural style since ancient times, which can be seen all over the world. Texture can exist in architecture on both exterior and interior surfaces. 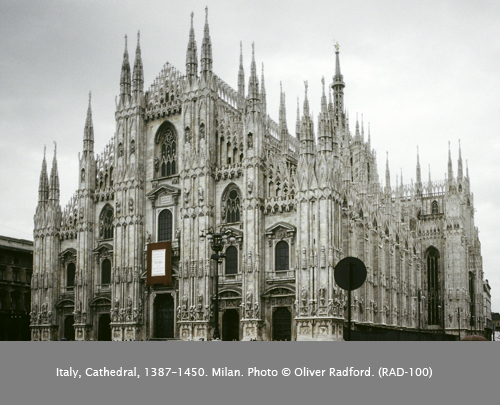 This week’s blog will focus on the exterior of buildings as a manifestation of texture. It is achieved in a number of ways, as you will see. The Temple of Hera II at the Greek colony of Paestum in Italy (ca. 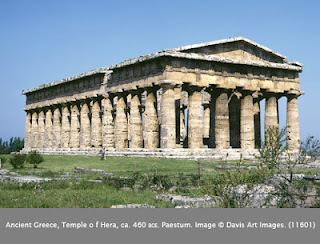 460 bce) was built after the classic Greek temple design had been established in the 7th century bce. 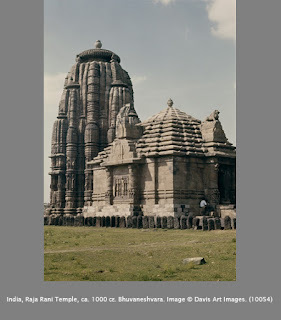 This temple is missing the sculpture that would have adorned the pediment, thus creating texture. Also, the line of fluted flank columns (pteron) creates not just a rhythmic recession visually, but also visual texture. Raja Rani Temple, ca. 1000 ce, in Bhuvanesvara, India, is a fine example of the “medieval” Hindu style of northern Indian temple. The rounded tower and roof of the entrance hall are symbolic of the cosmic mountain. They are enriched by hundreds of sculptures and decorative plaques that give the immediate impression of a textured surface. Milan Cathedral, 1387–1450, is a Late Gothic gem that qualifies not only for the element of texture, but also the element of implied line (in the buttress piers). The complex surfaces are comprised of buttress piers topped by pinnacles, and walls enlivened by a rich sculptural program. The textural effect, both visually and physically, is akin to looking at lace. One of the aspects of Renaissance (ca. 1400–1600) and Baroque (ca. 1600–1750) art is Drama. Many Baroque buildings are huge, with incredibly complex façades. Longleat House, Warminster, Britain (1567–1579) was designed by Robert Smythson (1535–1614). The geometrically balanced mass of the building is relieved by the fenestration and numerous undulations of the facades which gives it a solid texture. 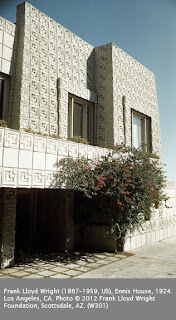 One of the many stylistic influences on Frank Lloyd Wright’s (1867–1959 US) work was Mesoamerican (particularly Mayan) architecture. The textured façade of Ennis House (1924, Los Angeles) reflects Wright’s interpretation of the mosaic stonework that adorned many Mayan monuments in Central America. 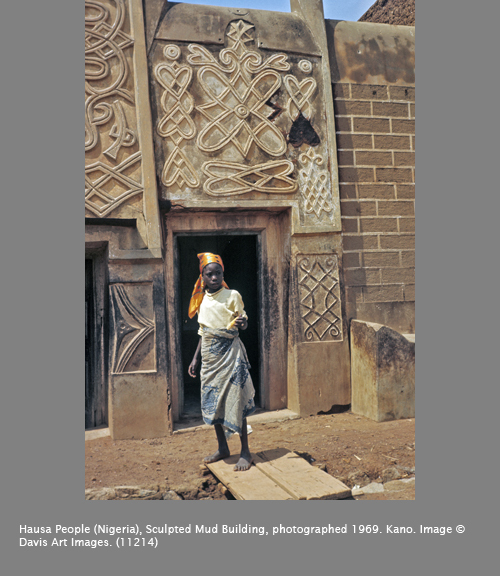 Nigeria has had a long tradition of painting and sculpting on the exterior of private and public buildings. 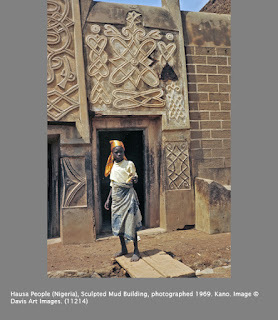 This photo shows a woman standing before the carved entrance to her sculpted mud home in Kano, Nigeria. 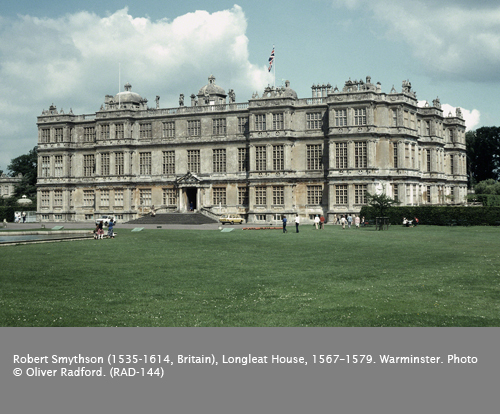 Such designs were traditionally meant to be considered to be symbolic of the family’s status. The mud used to seal the walls was thinned with water until it was the right consistency to allowing carving. The carvings on this house give a variety of textural patterns. The rejection of the “glass-box” aesthetic of 1960s architecture paved the way for a variety of new styles that explored other ways of thinking about architecture. 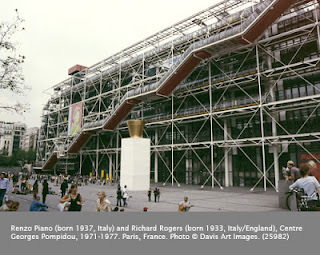 The Georges Pompidou Center [1971–1977, Paris, by Renzo Piano (born 1933, Italy) and Richard Rogers (born 1932, Italy)], is a fine example. The placement of traditional interior features of the building such as scaffolds, air conditioning and heating ducts on the exterior creates a lively, complex, textured surface. Frank Gehry (born 1929, US) was an early proponent of Deconstructivist architecture, a style that negated the traditional reliance of a building being composed of balanced, geometric masses. 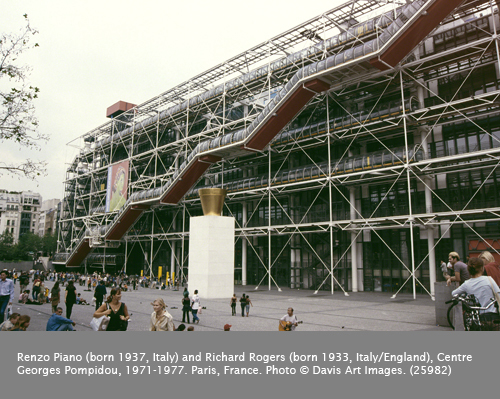 He is particularly known for his titanium-class, undulating facades that defy the definition of rectangular or square interior spaces. His style, however, creates particularly dramatic, rippling facades that display texture not only in the curving shapes, but also in the numerous individual sections of titanium. 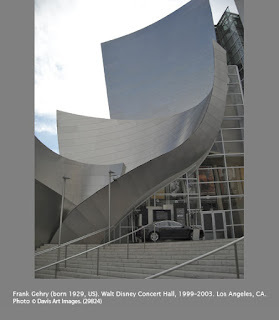 His Disney Concert Hall in Los Angeles (1999–2003) is a prime example of his aesthetic. Activity: Create a textured architectural façade. Using either a flattened rectangular slab of clay, or a thick piece of cardboard cut into a desired rectangular shape to imitate a building façade, design a textured building. With clay, use tools to incise, press, and scrape patterns into the clay, remembering to indicate windows. Small pieces of clay may also be applied to achieve a textured surface. With the cardboard, use bits of found objects to decorate the building “façade,” adding details (such as windows) with markers or colored pencils. Correlations to Davis programs: Explorations in Art Grade 1: 2.12; Explorations in Art Grade 2: 6.31, 6.32; Explorations in Art Grade 3: 4.20; Explorations in Art Grade 4: 3.16; Exploring Visual Design: 6; The Visual Experience: 11.7, 11.8.